Aspiring first-time young drivers between the ages of 18 and 24 who don't have a drivers license in Texas, must take a 6 hour drivers education course before they can receive a license in Texas. This is mandated by Texas DPS to make roadways safer and make You a Better Driver. A driving safety course or drug and alcohol driving awareness program are not acceptable as driver education courses for this requirement. Don't get fooled into buying a non approved course. Here is the list of TEA approved adult drivers education online course providers..
How to get your Texas driver's license at ages 18 to 24 and over 25? » Go through easy to do chapters. » 10-question quiz at the end of each chapter. » Pass quiz with at least a 70% to proceed. » Three (3) tries to pass, or re-take the course. » 30-question final exam (15 pertaining to road signs and 15 to road rules). » After you have passed the TX Adult Driver Ed course, Waive the DPS Permit Test (you will not be required to take a written exam at the Department of Public Safety). » Get certificate of completion with free overnight shipping (delivery). » Make an appointment for your road test at the Texas Department of Public Safety. » Take Certificate of Completion and other necessary Documents. » Take your eye (vision) test at the DPS. » Take your road (behind-the-wheel ) test at the DPS. » Congratulations, You'll get your license in no time! Texas (House Bill 2730) law requires that all applicants under the age of 18 take the driving skills exam to receive a driver license. The law also requires that a provisional driver license (under 18) or instruction permit expire on an individual’s 18th birthday, removes the requirement that a provisional driver license or instruction permit be renewed annually and increases the fee for those licenses from $5 to $15. It also extends the current phase-two restrictions for holders of a graduated driver license from 6 months to 1 year. These restrictions include limited night driving, prohibited use of wireless communication devices and a limited number of passengers. Texas House Bill 339 increases the total hours of behind-the-wheel driving instruction a teen receives from 14 to 34 and creates an adult driver education requirement for applicants older than 18 and younger than 21. In Texas, everyone who wants to get their license must first complete a driver education program, but it’s different if you are over 18 years of age. Taking a 6 hour adult driving school course is the first step to getting your license if you are 18 to 24 and the rest of it is really easy. 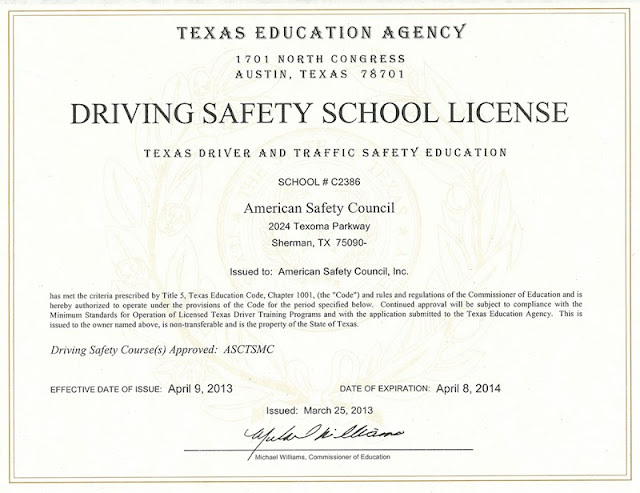 You must take a course that is approved by the Texas Education Agency to meet the requirements, but you can take a 6 hour driving course online Texas if you want.To get your Class C drivers license in Texas, the DPS requires you to pass the knowledge and road test examinations. TEA approved 6 hour driving school online for ages 18 to 24 [new to State Drivers] & convenient for 25 or older also. And if you're new to Texas but already have a license in another state, you must apply for a Texas DPS drivers license within 30 days of becoming a Texas resident. You can take the course over internet without attending traditional classes to get driver's license in Texas. 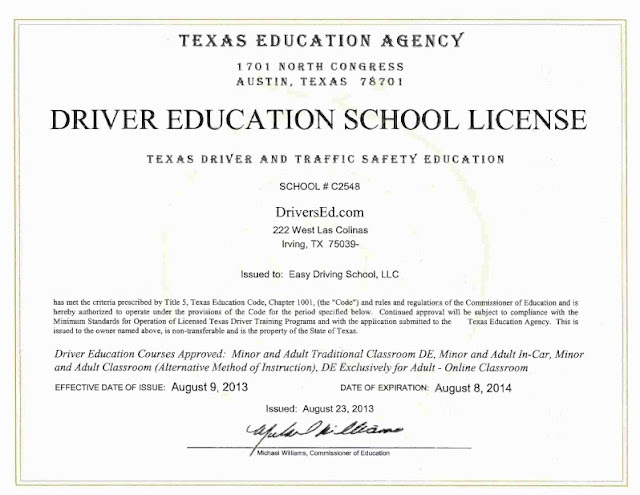 Taking Texas Adult Driver Education online course is more than just an easy way to obtain a driver's license. It's about saving lives, building responsible driving habits, bringing knowledge on texas state traffic rules and laws in young drivers to create safe environment on roads through convenience, quality, and self-pace online education. Register for the adult driving course and prepare to get your driving license online. Hey just wondering if you have a permit before, do you still need to take the 6 hours course or you do not need that. Just need to bring your permit and other certification with you will be fine?